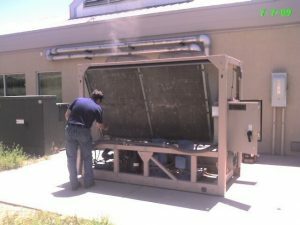 Advanced Refrigeration, Heating & Air specializes in commercial/industrial HVACR emergency repair (available 24 hours a day), preventive maintenance, and obsolete equipment replacement. Typical customers include: retail stores, factories, municipal and public office buildings, museums, laboratories, schools, hospitals, churches, restaurants, breweries, assisted living facilities, and oil field companies. We service every type of commercial heating and cooling system, and go far beyond what others do by investing in the extra training and equipment necessary to properly protect your equipment. Please review our recent projects for examples of equipment we service and/or install, and please give us a call to discuss your needs. Our knowledgeable staff is here to help you: Call (970) 242-3968 today!